Hales Gallery is pleased to present its first solo show with London based Sculptor Tom Price. Angell Town features five works, all figures of similar proportion and scale placed upon salvaged, revitalised and adapted plinths. Price has imbued each character with a seemingly plausible and believable persona however they are all fictional hybrid identities. Each invented and constructed with the help of people he has observed on the street or from magazine images and from looking at neoclassical and classical sculpture. All of the figures are male, black and clothed in simple contemporary attire. Price has also vested them with the 'accessories of modernity'; the telltale bulge of a mobile phone tucked into a pocket, the branded training shoes and a corporate name badge pinned to a jacket. The facial expressions are also carefully crafted; with all five men looking as if they are in a state of contemplation. Price's figures have their origins rooted in Classicism and the more recent Neoclassicism, however he subverts the idealised bodies of Greek and Roman sculpture, instead presenting us with modern archetypal figures. 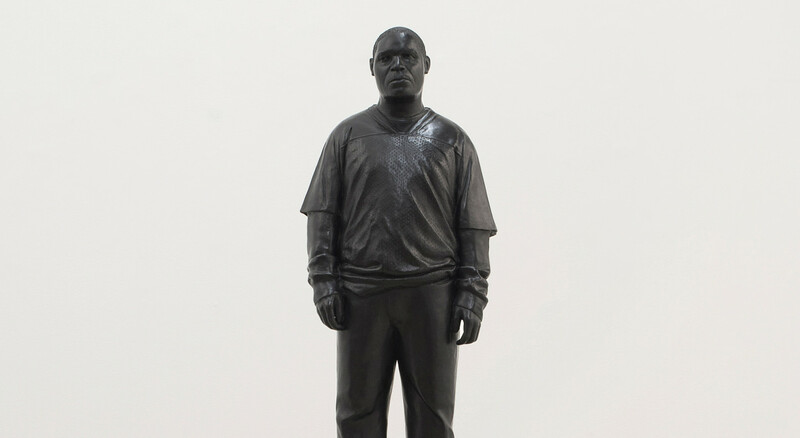 The effect challenges the viewer to examine simultaneously, both their symbolic place as part of a western culture and the role of the black male in the history of sculpture. The rejuvenated plinths on which these figures sit have been modified by Price with coats of varnish and gloss paint. One can imagine these columns gracing the corridors of power, in a bank building or Cathedral. Price cleverly uses their decrepit pomp by placing them below his 'Ordinary Joes' and in doing so tests the viewer's expectations and question past hierarchies in sculpture. The titles of the works, and indeed the name given by Price to the show, Angell Town, encourage the viewer to develop a mental construct of these characters, where they live and what they do. Each figure is given a geographic identity based in the areas of London where Price has lived and worked for a considerable time. These are low rent areas that are not only the places that artists often choose for studios but also the historic bases for London's immigrant community; Hackney, Brixton, Dalston, Deptford. The titles suggest a romanticised view of the city and its inhabitants, akin to the characterisation and locale portrayed in a Charles Dickens novel. Often, Price will use a street name with historic gravitas or mythic qualities such as Achilles Street, making the ordinary sound heroic and the fabled appear normal. Price's mother is White British and his father Black Jamaican. This has put him in an interesting position in relation to the traditions of western sculpture, which he manipulates, performing a volte-face from the stance taken by many modernists influenced by tribal sculpture. In this way, his sculpture manages to be both traditional in materiality and progressive in its cultural and conceptual significance.